Will Ford Bring 2019 F-150 ‘Freak-O-Boost’ To Alberta? Too often do concept vehicles remain on the drafting page - with engineers unable to translate hand-drawn perfection to messy reality. We have our fingers crossed, however, that the Ford team will manage to deliver a true-world experience… because we want to see the 2019 F-150 Freak-O-Boost in Alberta. TFL Truck has just revealed the latest Ford concept pick-up - the Freak-O-Boost. Despite its peculiar name, this truck is already earning admiration from critics and F-Series fans alike, promising class-shattering performance… if it manages to make it to the highway. Beneath its hood sits a 3.5L V6. A twin-turbocharger delivers full-throttle sequencing, while Head Games cylinder heads move in seamless tandem. An XDI high-flow pump improves intake responses; and an upgraded intercooler helps to maintain optimum temperatures, allowing the powerpoint to generate an estimated 375 HP and 470 lb.-ft of torque. Ford further impresses by pairing the Freak-O-Boost with 17-inch compression wheels - which let the truck roll smoothly over any terrain. These all-season options promise adventure with every mile. We’ll admit: we want to see this pick-up on our lot… and we’re not the only ones. Critics are already calling for a North American launch, and we can only hope that the Big Blue Oval will listen to them. To learn more about this F-150 variant contact our team today. Will The 2019 Ford F-250 Off-Road Adventure Come To Alberta? Is this the next generation of F-Series performance? Critics certainly hope so - keeping their fingers crossed and their eyes on the horizon. Aftermarket tuner, Wilderness Collective, has just partnered with Ford to create a new pick-up powerhouse; and excitement is beginning to build. According to AutomobileMag, Ford has just unveiled its latest pick-up powerhouse - the 2019 F-250 Off-Road Adventure. This truck (which was a SEMA concept) is aptly named, emphasizing all-terrain fun in Alberta. It sits on 37-inch tires, which deliver an aggressive stance. Heavy-duty bumpers frame the front and rear, while a 2.5-inch lift increases ground clearance. A roof-rack allows drivers to quickly store camping gear, kayaks, and more; and a winch promotes effortless Class IV towing. Floodlights illuminate the darkest roads, and an LED bar assures improved visibility during wet weather. To further enhance adventures, this F-250 also features a custom rooftop tent - which quickly transforms the extended bed (98.4-inches) into an outdoor sleeping area. After a long day of exploring, prepare to relax in pure vinyl comfort. The 2019 F-250 Off-Road Adventure promises dynamic experiences - and we can only hope that Ford will offer this truck a wide release. There are trails to find and memories to make; and this is the ride for both. To learn more about this F-Series truck contact us today. It may be 2018 - but Ford (in partnership with aftermarket tuner, Hoonigan) is delivering a 70’s experience to North America. Prepare for a pick-up like no other. According to Road and Track, a custom F-150 will soon make its debut. The Hoonitruck (designed by rally champion, Ken Block) is a beastly hybrid, blending the chassis of a 1977 model with a modern-day V6. The result is a circuit-ready platform that will crush the competition, delivering 914 HP. The Hoonitruck is intended to dominate the Gymkhana 10 event (a series of races held across multiple locations). On the track it will dazzle guests - with its twin-turbo 3.5L EcoBoost growling with every rev. Custom Fifteen52 tires will anchor the body, delivering beadlock designs that will shred the pavement; while a custom 3D-printed manifold will ensure maximum intake levels, regulating valve performance with precision. The all-wheel-drive-train will further impress, providing smooth articulation and electronic stability control. The true value of this truck, however, is its design - which utilizes body panels from the 1977 F-150. This creates a vintage effect on the track, with square fenders and a short-bed proving impossible to ignore. Hoonigan and Ford further emphasize the classic lines by adding orange wheel covers, a wide front bumper, and camouflage-inspired decals. The result is the perfect fusion of old and new. To learn more about the F-150 Hoonitruck contact us today. 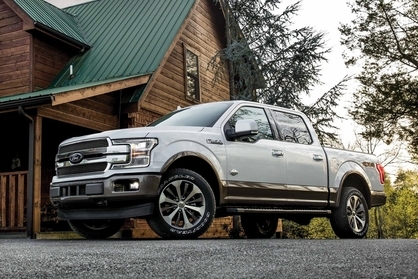 Luxury is expected; comfort is guaranteed; but, as you peer at the 2019 F-150 Limited, you can’t help but wonder whether this pick-up has become too… tame? How can a platform drenched in chrome and supple leather deliver the off-road performance you need? Ford suggests you take it for a spin. As TFL Truck explains, the new Limited promises more than luxury styling. Instead Ford has fused this pick-up with a high-output engine, allowing drivers to experience full-throttle thrills with every mile. Peek beneath the hood and discover a 3.5L EcoBoost V6. This powerpoint promises 375 HP and 470 lb.-ft of torque, ensuring best-in-class capability. Twin intercooled turbochargers expedite sequencing, enabling the redline to reach its 5,000 RPM peak with virtually no lag; while a 10-speed automatic transmission offers nimble gear changes. A direct-acting mechanical bucket controls valve operations; and the combination of port and direct injection technologies maximizes fuel intake. This promises incredible performance - with the 2019 F-150 Limited yielding an estimated 0 to 60 run of 5.1 seconds. Despite its chic appearance, this platform proves a true backroad contender. Want to slide inside? Visit our dealership today to request a test-drive in the new Limited - and don’t hesitate to enquire about our available financing options as well. Is it possible to improve what’s already perfect? Ford is determined to try - introducing SEMA audiences to its 2019 F-150 Lariat Sport. This custom pick-up pushes the boundaries of performance, injecting track-worthy power into the half-ton market. According to The Drive, the 2019 F-150 Lariat Sport has just made its North American debut. Ford recently revved the truck into SEMA and critics are clamoring for a peek. We don’t blame them. This platform - made in partnership with Kurt Busch and ZB Customs - promises extraordinary power, with its 5.0L V8 paired with On3 twin-turbochargers. A 10-speed automatic transmission produces seamless gear changes, while a sport-tuned suspension enables deft handling. When these technologies combine, they allow the pick-up to soar to a shocking 1,000 HP: leaving competitors and expectations in the dust. To further excite SEMA fans, the 2019 Lariat Sport also delivers circuit styling - pairing its V8 capability with a carbon spoiler (to divert air currents) and a front-mounted splitter (to reduce friction). The result is an aerodynamic platform that can sail over any terrain with ease. Power is assured. Prepare for a new generation of F-150 performance, Alberta! To learn more about this SEMA-bound ride contact our team today. Dreams do indeed come true - even in the guise of a Nitemare. Prepare, Alberta, for the arrival of the latest F-150 beast. According to Torque News, the 2018 F-150 Nitemare is coming. This specialty platform (which was created in partnership with aftermarket tuner, ROUSH) will serve as the ultimate off-roader, delivering staggering performance metrics with every mile. Beneath its hood roars a 5.0L V8. Flanked by a TVS R2650 supercharger, this powerpoint yields 650 HP and 495 lb.-ft of torque; while a 10-speed automatic transmission promises smooth handling, effortlessly identifying the optimal gear ratio for each terrain. A custom-tuned suspension nimbly adapts to changing pavement grades; and 22-inch wheels rip through dust, with their wide-spoke designs and all-season tires rolling over the deepest ruts. To further thrill on the backroads, the 2018 F-150 Nitemare also features an exclusive exhaust system - which pairs sound-control technology with smartphone interfacing. With the press of a button drivers can define each decibel, engaging the throttle at low, medium, or high settings to create an adventure-worthy soundtrack. Open and close the valves at will, directing air-flow and audio levels with ease. The 2018 F-150 Nitemare will prove a perfect addition to every Alberta trail. To learn more about this platform - or to request further information about other partnerships between Ford and ROUSH - contact our team today. With the release of the 2018 F-150 Raptor Ford embraced more than power. Instead safety proved the driving force of every decision - with the brand determined to redefine the back-road experience. No longer would rough trails undermine passenger protection. As AutomobileMag explains, the new Raptor isn’t just a twin-turbo performer. Safety instead defines every mile, with Ford fusing this platform with the exclusive Technology Package. High-beams anchor the front, yielding halogen clarity and increased visibility; while automatic wipers respond to changing moisture levels in the air, ensuring a drop-free windshield. Adaptive cruise software regulates acceleration, instantly engaging the ABS system if its bumper-mounted sensors detect an approaching obstacle; and lane-departure warnings notify drivers of sudden misalignments, assessing trajectory and passing road markers in real-time. This function is then paired with Ford’s lane-keeping tech - which will smoothly activate the column, guiding the truck back to the proper road position. Speed is decreased; all-wheel braking is applied; and the result is a seamless pitch change, with drivers maneuvered away from potential harm. These features ensure that the 2018 F-150 Raptor delivers premium security on every trail - promoting peace-of-mind with each mile. To learn more contact us today! Alberta: Are You Ready For The 2018 Ford F-150 Raptor Heritage Edition? The time has come, Alberta. As a new automotive season begins Ford revs its way down the highway - unleashing V8 power with every mile and demanding the attention of half-ton fans. The 2018 F-150 Raptor Heritage Edition is barreling toward the market; and we… can’t wait. According to Top Speed, Ford is redefining the pick-up segment. Its 2018 Raptor has been fused with a suite of upgrades (courtesy of aftermarket tuner, Hennessey); and the Heritage Edition will soon reign supreme on the charts and byways alike. This platform boasts a 5.0L V8, which generates 758 HP. A 2.9L supercharger ensures class-leading boost pressure; while a high-flow induction system optimizes air intake, allowing the block to maintain precise temperatures with each rev. An electronic management calibration console monitors every metric, seamlessly adjusting torque output to create a peerless redline; and the inclusion of a new water intercooler promotes smooth sequencing. The 2018 F-150 Heritage Edition proves ready for any terrain - with its 35-inch off-road Toyo tires cutting through the miles. 10-spoke performance rims yield a sturdy stance, while integrated sway bars enhance the suspension system (allowing it to more effectively adapt to changing inclines). This beast will venture everywhere with ease. Want to learn more about it? Visit our dealership today to request further information about the new Raptor!